Combine both milks into a non-reactive pan (stainless or enameled cast iron are good choices) and heat on medium-high. Stir occasionally, paying attention to the bottom of the pan to avoid scorching. Once the milk is hot (but not boiling), stop stirring. You will start to see curds rise and come to the surface. Run a spoon or spatula along the bottom of the pan occasionally to free up any stuck curds. When the mixture reaches about 175F°, you will see the curds and whey separate. The curds are the clumpy white mass. Line a colander with a large piece of cheesecloth that has been folded a few times — you should have about three layers. Place the lined colander over a large bowl or sink. gently begin to ladle curds into the sieve. Pull up on the sides of the cheesecloth to drain off any extra liquid, but resist pressing on the curds. Gather the edges of the cloth, tie or fasten them into a knot and allow it to drain for 20 minutes or so. Once drained, transfer the cheese to a bowl and season with nutmeg, lemon, thyme, salt and pepper. 1 pound fresh favas, little beans removed from pod. Fill a pot with salted water, bring to a boil and pop in the favas. Cook for 2 – 3 minutes, and drain with cold water to stop the cooking process. Now you’ll be able to complete the second shelling of the cute little beans. They should pop right out of their little shells. Reserve for garnishing the dish. 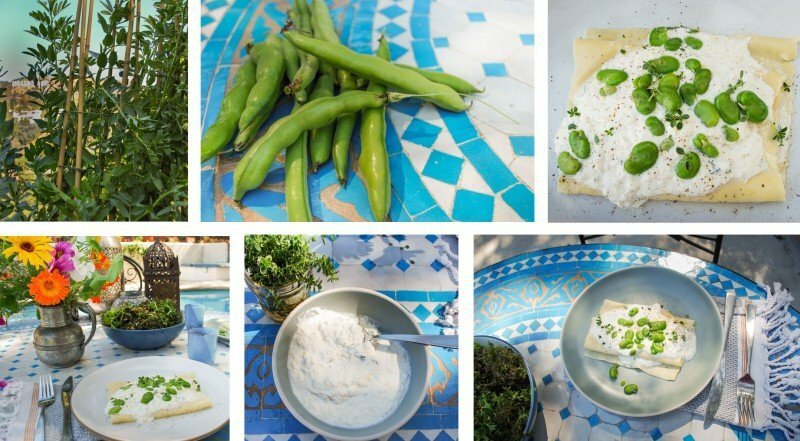 If you are not into the work that this requires – use fresh peas! Put the flour in a large bowl, make a well in the center, and add the eggs. Beat the eggs in with a fork until smooth, and then combine well with your hands. Knead, knead, knead, knead, until you have smooth dough. Cover in plastic wrap and chill in the fridge for at least an hour. Cook the pasta in salted water and drain. Fold onto the plate, filling with a few spoonfuls of ricotta as you go. Top with another plop of rocitta, fava beans, lemon zest and thyme.